See here for the film: https://www.youtube.com/watch?v=QjmKE-NJdjg. 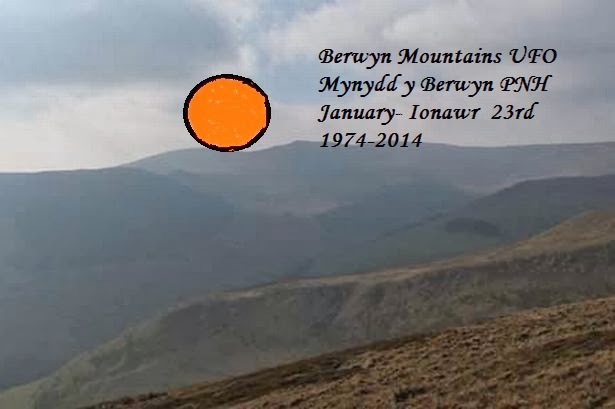 The Berwyn Mountains UFO Incident, the "Welsh Roswell", is the most significant UFO event ever to take place in Wales. On the 23rd of January 1974 the people in Llandrillo and other remote villages surrounding the Berwyn Mountains in north Wales experienced an earthquake and an explosion accompanied by strange lights in the sky. One witness driving on a high mountain pass saw a strange circular luminous object on the ground. The 23rd of January 2014 marks the fortieth anniversary of the incident and a special event was held in the area to commemorate it and to encourage interest in this unique occurrence. See here for more details: http://hpanwo-voice.blogspot.co.uk/2013/11/berwyn-40.html. Give me back my Debt!